There are a fair few elements in the bloated The Raid 2 that don’t quite work. If you didn’t know director-writer-editor Gareth Evans had refitted another of his scripts with the central character from the first film, it probably wouldn’t entirely surprise you. The first The Raid was nothing if not focussed; the film was its relentless trajectory. Here, Edwards fundamentally eschews that drive. There’s still an objective in mind, but it comes by way of sprawling crime drama and, as such tales are wont to do, he becomes distracted by the broader canvas; he wants to play as much as he can in his new sandpit. It’s only when he recalls why the audience have turned up for a sequel in the first place (not for ladles of dialogue and subterfuge, let’s be honest) and gets stuck into the dazzling action that the picture more than hits its marks. It may not be a masterpiece, but The Raid 2 further illustrates Evans’ increasingly refined talent. This kicks off directly after the events of the original as Rama (Iko Uwais) is persuaded reluctantly to go undercover in order to expose the corruption that is rife within the police force. To do this he must infiltrate the Bangun (Tio Pakusadewo plays its head) crime family, which necessitates his being imprisoned, and make chums with Bangun’s son Uco (Arifin Putra). Rama succeeds in this, and on release it becomes clear that Uco has designs on his father’s kingdom. Uco is uncomfortable with what he sees as a lack of respect from Bangun’s partners, the Japanese Goto family, and enters into a deal with rival ganglord Bejo (Alex Abbad) to usurp his pater. Rama must maintain his cover while learning his superiors are as unreliable as his new business partners. That’s about the size of it, and Evans handles the changing locations and situations with panache. But the mob family strife plot is a well-wrung one, and the back-and-forth politicking is not always a good fit with his capacity for excess. He has said that he has treated this more as an ensemble piece, but that doesn’t suddenly put in the league of The Godfather (or even Heat). Rama disappears for what seems like most of the second act, which rather betrays how he has been shoehorned into the plot. Elsewhere, there’s a superb fight sequence that extends to a snow-covered alley in which Bangun’s top assassin Prakoso, (Yayan Ruhian, one of Evans’ fight choreographers who – in a move reminiscent of Lee van Cleef in the Dollars movies – played a different character, Mad Dog, in the first film) who poses as a beggar when he isn’t on the job, is assassinated. It serves the storyline, true, since his slaying is Uco’s manoeuvre to have Bangun break the pact with the Japanese (they will be blamed), but in a movie this long (150 minutes) it feels like a distraction when Rama has been relegated to the sidelines. Evans has too much to revel in, and too much to juggle. This might be why he never gets around to de rigueur cop undercover moments such as the criminals discovering the weasel in their midst (in the end, Rama just decides to take the fight to them after he rescues another undercover cop Eka (Oko Antara) or using the hero’s family as a tool. It’s hardly the Die Hard of family portraits when the hero’s family gets one scene (one and a half including the phone call); they’d never be in any danger because the director would have to put some serious character work in to make Rama more than just the angelic husband and father. Others have suggested The Raid 2 improves on the original by giving more substance to story and character, but I don’t think it is sufficiently superior in either respect to justify its length. So it comes down to the action, understandably, for the real thrills. From the attack in his cell, to the mud bath prison riot, to Rama fending off an onslaught by dirty cops (and I don’t mean covered in mud) the action is as entirely brutal as before but with even greater scale. Evans has the budget to perhaps overdo the crane shots now, and the extended car chase isn’t quite up to par with the mano a mano action, but once he hits the last thirty minutes what’s on screen consistently exceeds the insane fury the original. This action, as Rama goes up against a selection of kooky killers (again, Evans doesn’t seem bothered about maintaining verisimilitude) including Hammer Girl (Julie Estelle) and Baseball Bat Man (Very Tri Yulisman) before facing off against Uco and Bejo is frenetic and breathless non-stop mayhem. At its best The Raid 2 eclipses the original, but as a whole it’s the lesser of the two. You can’t fault Evans for thinking big. He takes the customary approach of increasing everything for the sequel, and yet he avoids the usual weakness of providing no more than a bigger budget retread. Uwais has grown in confidence in his performance as Rama, particularly as he’s called on to deliver a succession of silent sizings up of situations and communicating his dilemmas through expressions alone. Evans has already announced The Raid 3, which is expected to be as different again as The Raid was from 2 (and, taking a leaf out of The Bourne Ultimatum’s hat, it seems it is to take place a couple of hours before the end of 2, which I’m taking with a pinch of salt at the moment). 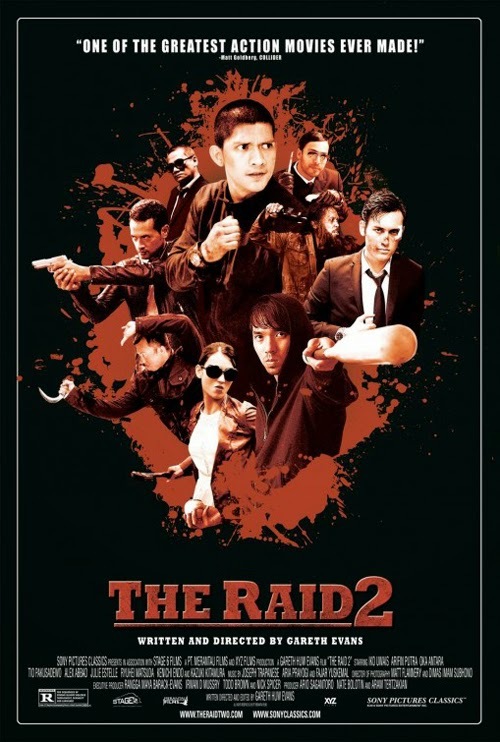 The Raid 2’s a nearly-but-not-quite great movie; the sure sign that it was one would be not sitting there itching to get to the next big fight set piece while all the talky stuff is going on.